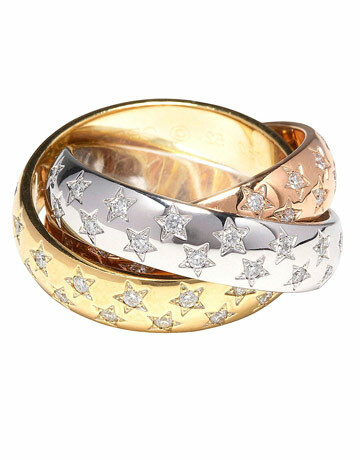 Designed in 1924, Cartier’s iconic Trinity Ring boosts three types of gold; White for Friendship, Rose Gold for Love, and Yellow Gold for Loyalty. French poet visionary, Jean Cocteau, first adopted this ring and never took it off again and in 1925, the ring appeared in the Vogue American Edition. In its 85 years of existence, has become one of the world’s most renowned rings. This year, Cartier celebrated it’s 100 Year Anniversary, and introduced its latest out-of-this-world collection of jewelry on the runway of Phillip Lim’s fall show. A modern interpretation of the Trinity design, this celestial set of rings, bracelets, and earrings features a glittering star motif made of diamonds.